Industry Inspires Impact Live's Derlis To Keep On Rockin in Barrie! Industry Inspires Impact Live's Derlis To Keep On Rockin in Barrie - Celebrating 30 Years! John Derlis has always loved to party. From his high school days in the 1980s to stints at Ruanne’s, Goodfella’s, The Docks in Toronto, The Roxx and now The Ranch, he brings in bands that bring in the crowds. “Deep down, I’m a rocker. All my roots are rock-based,” said the 48-year-old Impact Live owner, whose career has also included managing and owning clubs. As a teen, he joined the committee that organized his school’s spring formal dance. “From high school, I was doing singles parties and that turned into larger and larger and larger parties,” he recalled the heydays of Ruanne’s in the 1980s, the place to be for singles. 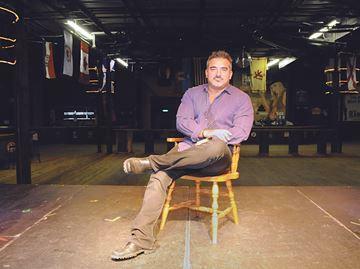 Celebrating 30 years in the entertainment business, Derlis knows how Barrie has changed. He has seen the rockers age and country music bring in mothers and daughters, fathers and sons, to hear bands at The Ranch. “There’s a lot of crossover. There’s a new country movement now. It appeals to some of my rock buyers,” said Derlis, adding working with KICX FM, Rock 95 and The Ranch’s Al Quigley have been critical in offering great shows as well as raising funds for charity, such as the current Radio for Cardiology campaign. The acts on his bills span genres and decades — international superstars and upstart local bands. He started the Barrie Waterfront Festival in 1996, which featured rising country singer Michelle Wright and rocker Kim Mitchell outside the Southshore Centre. In 1997, he was also marketing director at The Docks in Toronto. The Rolling Stones decided they’d like to meet Venus Swimwear Model Search finalists while taking some down time on their Bridges to Babylon tour and Derlis was the man that made that happen. “I got to meet and hang out with them in the upper VIP area at The Docks. It was pretty special,” Derlis recalled. Iconic Canadian band Lighthouse’s last performance with singer Bob McBride, who died in February 1998, was there. “Back then, the lead singer was everything. His last show was at Goodfella’s,” said Derlis, adding the band filled the restaurant. And throughout his decades, he has had a knack of spotting talent. He credits his Impact Live team, too, for the energy they bring. He couldn’t do it alone. “I’m slowing down,” he said, but added he’s not yet done with music.